In it, I said “My short summary here is just an overview, there is obviously a lot more to be said on the topic.” Well, it’s been over two years, but here it is. 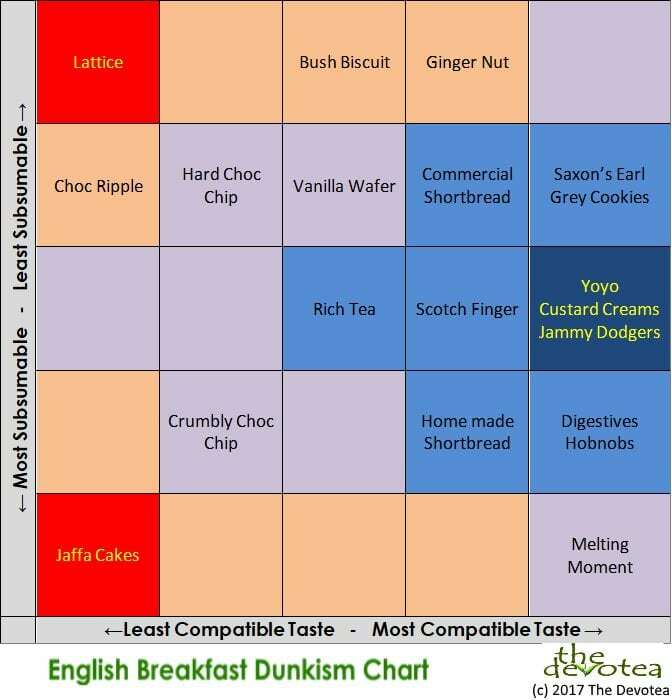 The Compatibility Index – Does the taste of the biscuit complement your tea? The Subsumation Index – Does your biscuit strike the right balance between being too susceptible to melting to your cup and too water-resistant? Graphing these is a little off, because when it comes to the Compatibility Index, 1 is bad, and 5 is good, whereas in the Subsumation, both 1 (too crumbly) and 5 (water-resistant) are bad, you are seeking the middle ground of 3. And so we have a chart. What chart? Oh, this one. So, for example, let’s take the Lattice biscuit, which is lemon cream, between two slight salty hard crackers. Graphing it for English Breakfast, it scores 1 for taste, because no-one wants salty tea. It scores 5 for subsumation, because it is water resistant. It therefore occupies one of the red areas of the chart. I’ve taken the liberty of inserting some Australian versions of biscuits into this. For example, the Yoyo, a fine vanilla tasting biscuit is a delight with tea (that’s 5 for taste), and it scores a 3 for Subsumation, being hard enough to sustain a good dunk, not prone to post dunk subsidence but also absorbing an appreciable amount of tea. 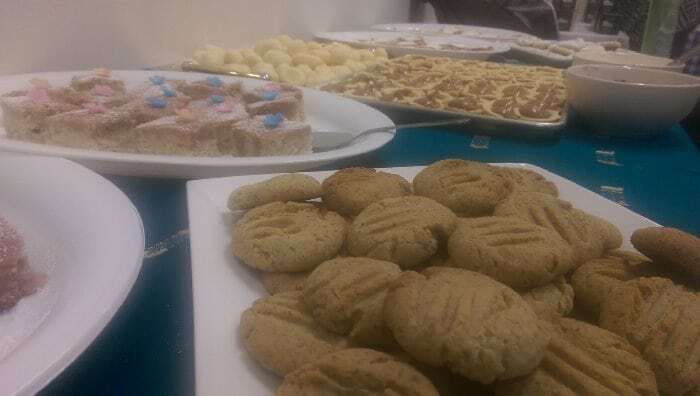 Other biscuits are international, such as Custard Creams and Scotch Fingers, although one can get caught out: A Rich Tea biscuit is a small rectangular biscuit with currants in some markets, a round shortbread with a hole in it in others and more like a digestive in yet others. I’d like to invite any readers to post any biscuit they care to in the comments here, along with rating for taste and Subsumation. I’ll then update the chart and later will find a permanent home for it on line somewhere. One note: many fine institutions, such as British newspapers* often try to work out the “best” biscuit for dunking and they usually get it wrong. Firstly, the make no allowance for compatibility and secondly, they hold the biscuit in the tea until it collapses. They are leaving out the important factor of getting it to your mouth. Subsumation is not just in-liquid but also, even more importantly, is timed from dunk to mouth and not via trousers. Let’s turn this chart into a crowd-sourced resource for those about to dunk. We can change the world. No longer will trouser-fronts be shortbread-coated. No froth of wafer should besmirch a smart tea dress. No longer should the bottom of one’s cup be crumb-filled. Proper scientific Dunkism is the answer. Sorry, today is also not that day. *Sarcasm, in case you missed it. Interesting theory. I am not sure that I am as rigorous as you in my choices.